Can you hear the world’s biggest oil company licking its wounds? For a company clearing $15bn profits, Exxon (aka Esso and Mobil) had a bad 2015. First came revelations of an internal cover-up of its own climate change research since the 1970s. Then, having sponsored the denial industry to the tune of some $31m, the Paris climate conference consigned that debate to diplomatic history. Paris also undermined market confidence in the long term value of fossil fuel reserves which may have to be left in the ground – confidence previously called into question by the governor of the Bank of England and the crescendoing victories of the divestment movement. So Exxon’s report “Outlook for Energy: A View to 2040”, hard on the heels of its 4th quarter accounts for 2015, is part of a tightly managed PR campaign designed to settle nerves. Exxon doesn’t need lessons in PR. Yet the report comes across a little desperate. It’s oddly elating. Think like an investor. You don’t worry or know much about climate change. But with money at stake you aren’t quite as partial as most to being told what you want to hear. You need to feel confident in the company, its business plans and the political landscape. Thing is, you don’t – not like you used to. Exxon’s report reveals a culture still mired in deceit. To be certain that “oil will remain the world’s primary fuel” in 2040, you have to fly to planet Exxon. Here fracking, deep sea drilling and tar sands technologies raise no concerns, they are simply “tremendous advances”. Far from continuing towards electrification, new car technology will help us travel further “with the same fuel.” You notice that the report’s logic doesn’t even make sense in its own unhinged terms. Having feigned mild concern over climate change throughout, page 61 finally announces “enormous” oil reserves of 4.5tn barrels, enough to supply the 21st century. Exxon wants to burn it all, as well as more gas - gas which would only “help reduce climate change risks”, as the report claims, if it replaced the oil. You don’t have to despise fossil fuels to work that out. So you wonder, will politicians continue to smile on fossil fuels, with subsidies, infrastructure and legal freedoms? Politicians exist in their own climate fantasy – we’ve already emitted enough greenhouse gases to take average warming beyond Paris’ 1.5oC target. But crucially it’s a different fantasy from the one Exxon wants them to believe in. Politicians are adapting on the hoof to a world in which climate-related stories make the front pages daily. Take the UK’s news: Syrian refugees are fleeing a war exacerbated by severe drought; much of the “red tape” pro-Brexit leaders hate is environmental legislation; VW’s hidden emissions are the downside of diesel’s CO2-efficiency. And then there’s the weather. David Cameron came home from Paris to accusations that floods considered one-offs a decade ago were now so predictable that he should have acted years ago to protect people from them. Throughout the report, Exxon highlights the historic link between fuel consumption and rising standards of living - Exxon’s dream dovetails neatly with your dreams and mine. But times have changed. Far from making our dreams come true, fossil fuels are destroying our hopes of stability and prosperity, and enough people have joined enough dots to know why. 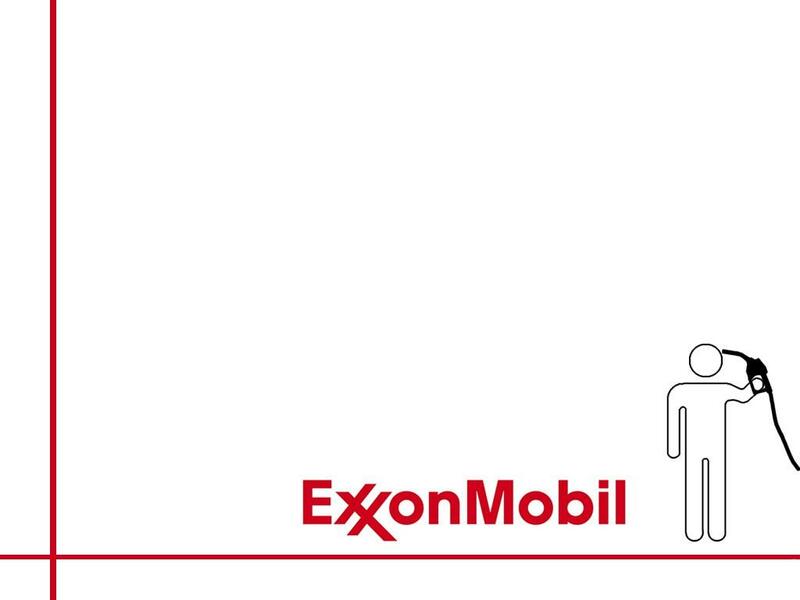 If Exxon’s dream comes true, no-one else’s will. Dreams are the currency of politics, they are what politicians sell us at every election. 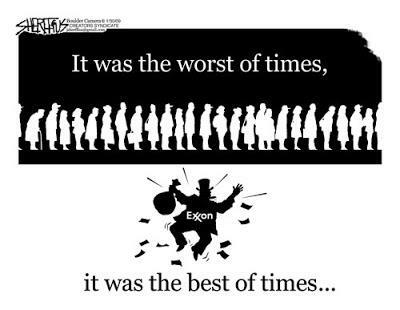 Smile, because Exxon’s dreams just aren’t the gold bullion they used to be. **** Matt Carmichael is a climate educator and co-author with Alastair McIntosh of Spiritual Activism.